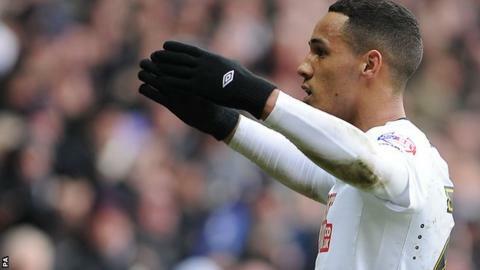 Thomas Ince scored twice on his Derby County debut as the Rams eased to victory over Bolton to remain level with Championship leaders Bournemouth. With the game's first effort on goal, transfer deadline-day loan arrival Ince curled a free-kick into the top corner. Jeff Hendrick coolly finished to double the advantage, before Ince made it 3-0 early in the second half. Filip Twardzik pulled a goal back, only for Hendrick to nod in a second of his own, while Ince also hit the post. The victory is Derby County's eighth in nine matches in all competitions and sees Steve McClaren's men maintain their position in the automatic promotion places. Defeat for Bolton comes three days after they were knocked out of the FA Cup by Liverpool and leaves the Trotters winless in five games and 14th in the table. Wanderers were the first to threaten, with defender Dorian Dervite heading over the bar. But it was the closest they came to troubling the high-flying hosts early on. Ince, who joined from Hull City, was lively going forward and opened the scoring in superb fashion after Liam Trotter fouled Chris Martin. While Ince was off target soon after with a neat lofted effort over advancing Trotters keeper Andy Lonergan, Hendrick met a Will Hughes pass to make it 2-0 with a low finish from 12 yards. Bolton Wanderers' last win came against Sheffield Wednesday at Hillsborough on 17 January. Neil Lennon's side has since been beaten by Rotherham and Derby and shared the spoils with Wolves in the league. And while they forced an FA Cup fourth round replay with Liverpool, they were eventually beaten 2-1 in the return tie at the Macron Stadium. Ince netted his second of the afternoon less than two minutes after the interval, firing home after good build-up play from Hendrick, Martin and Hughes. A free-kick whipped in from Barry Bannan saw Twardzik get the final touch to score on his debut, just five days after arriving from Celtic. Lonergan denied Ward and Omar Mascarell, only to be beaten by Hendrick for a second time at the iPro Stadium, with the midfielder nodding home after Jake Buxton directed his header back across goal. Zach Clough tested Derby keeper Lee Grant on 72 minutes and the woodwork denied Ince a hat-trick in stoppage time. "It was a beautiful goal to start off from Tom Ince. The first goal was always going to be important and it was a cracker. He's slotted into our team and he's done that in training since day one. It looked like Tom had been in the team all season. "The key thing is Tom can score goals, he's got that knack. He wants to score and he can handle the ball, it's a great debut for him. "He just needed an opportunity and a chance to find a home and that's what we want to give him and I think with this team he can play in it." "It was a poor performance. We were comfortable for 40 minutes, then Tom Ince scores a fantastic free-kick but we didn't deal with the reaction at all well and we shot ourselves in the foot. "Derby are a quality side at this level and have strength in depth but we looked a bit lightweight in the second half and I'm not happy with the performance today at all. "I want a reaction as quickly as possible. It's all right the players lifting themselves for Liverpool, anyone can do that but these are the games they earn their living from and we were second best for large parts of this game but you have to give Derby credit." Jake Buxton (Derby County) wins a free kick in the defensive half. Corner, Bolton Wanderers. Conceded by Jake Buxton. Attempt saved. Simon Dawkins (Derby County) header from the centre of the box is saved in the centre of the goal. Assisted by Tom Ince with a cross. Tom Ince (Derby County) hits the right post with a right footed shot from the right side of the box. Assisted by Darren Bent. Attempt missed. Craig Bryson (Derby County) right footed shot from outside the box is too high. Assisted by Omar Mascarell. Simon Dawkins (Derby County) wins a free kick on the left wing. Foul by Simeon Slavchev (Bolton Wanderers). Offside, Bolton Wanderers. Barry Bannan tries a through ball, but Filip Twardzik is caught offside. Foul by Jeff Hendrick (Derby County). Filip Twardzik (Bolton Wanderers) wins a free kick on the left wing. Attempt missed. Simon Dawkins (Derby County) right footed shot from outside the box is close, but misses to the right. Assisted by Darren Bent. Substitution, Derby County. Craig Bryson replaces Will Hughes. Attempt missed. Darren Bent (Derby County) right footed shot from the centre of the box is close, but misses to the right. Assisted by Jeff Hendrick. Substitution, Derby County. Simon Dawkins replaces Jamie Ward. Will Hughes (Derby County) wins a free kick in the defensive half. Foul by Dean Moxey (Bolton Wanderers). Attempt saved. Zach Clough (Bolton Wanderers) right footed shot from the right side of the box is saved in the centre of the goal. Assisted by Adam Le Fondre. Corner, Derby County. Conceded by Dorian Dervite. Substitution, Bolton Wanderers. Eidur Gudjohnsen replaces Josh Vela. Corner, Bolton Wanderers. Conceded by Ryan Shotton. Goal! Derby County 4, Bolton Wanderers 1. Jeff Hendrick (Derby County) header from very close range to the top left corner. Assisted by Jake Buxton with a headed pass following a set piece situation. Will Hughes (Derby County) wins a free kick in the attacking half. Foul by Filip Twardzik (Bolton Wanderers). Will Hughes (Derby County) wins a free kick on the right wing. Barry Bannan (Bolton Wanderers) wins a free kick in the defensive half. Corner, Bolton Wanderers. Conceded by Craig Forsyth. Offside, Bolton Wanderers. Liam Feeney tries a through ball, but Adam Le Fondre is caught offside. Corner, Derby County. Conceded by Liam Feeney. Attempt blocked. Omar Mascarell (Derby County) left footed shot from outside the box is blocked. Assisted by Chris Martin. Tom Ince (Derby County) wins a free kick on the right wing. Attempt saved. Jamie Ward (Derby County) right footed shot from the centre of the box is saved in the bottom right corner. Assisted by Chris Martin.